Buying local is worth every penny. According to the Huffington Post, spending your hard-earned dollars into locally owned, small businesses re-purposes 68 percent of that money back into the local economy. These small businesses are utilizing other small businesses, they pay our local community wages and taxes, they are more likely to use environmentally friendly resources – paper, building material, etc., which in turn helps cut down on pollution. 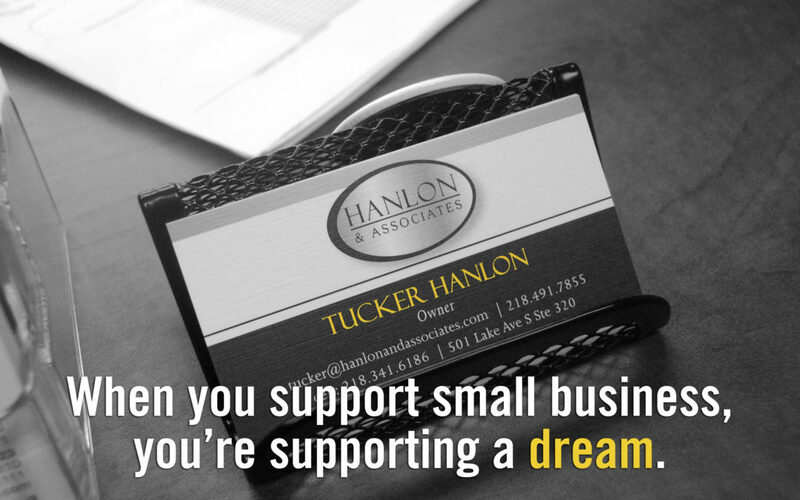 Hanlon and Associates is just that – a small businesses locally owned by Tucker Hanlon; father of four, husband, dog lover, hockey fan, fishing fanatic, and a born-and-raised Duluthian. You can’t get more local than him. Tucker launched Hanlon and Associates in January of 2014 after working for many years in the insurance industry. Recognizing a void, Tucker began this company to provide his clients an experience of trust, positive customer service, and honesty when dealing with the inevitable and commonly unappealing world of insurance. His business has grown to employ four additional personalities – Anna, Neil, Callie and Kristine – rounding out his small yet dedicated office of five. Our small business has a direct effect on the local community. Even beyond the statistics listed above, the Hanlon and Associates staff are a team of individuals helping to improve the community. The company itself is a member of the Duluth Area Chamber of Commerce, and provides financial support to local organizations such as Lyric Opera of the North (LOON), the Duluth Police Department, First Witness Child Advocacy Center, CHUM, and Ideal Cheer Elite. Tucker is an Ambassador of the Duluth Chamber, he is an active participant and supporter of the Pilgrim Congregational Church. Anna is a Leadership Duluth graduate, former Event Chair and Leadership Council member of Fuse Duluth Young Professionals, member of the AIM High Network, Professional Women’s Network, Duluth Superior ECO Rotary Club, and is a volunteer adviser to the Vice President of Phi Sigma Sigma UMD Sorority. And Neil is on several active Board of Directors: Duluth Sister Cities International, Women’s Health Center of Duluth, and the Duluth Public Library. Black Friday has historically been an incredible day for holiday shopping, spending, and economy boosting. While our office will be closed to spend the Thanksgiving holiday with our families, we hope you understand the power that shopping locally brings to the Duluth economy. By choosing to utilize Hanlon and Associates for your insurance coverage, not only are you directly supporting the families of our employees, but also the organizations with which our staff volunteers their time, talents, and financial contributions. A conversation about insurance doesn’t need to be a chore, or a dread. In fact, our staff is truly passionate about insurance and the city of Duluth. We are here to help protect your family and your business, to build quality relationships with every single client, and help grow our community stronger. We hope you join us in supporting local this season.